Century Park South Expansion Plan. Project to commence Fall of 2019. Government Finance Officer’s Association (GFOA) certificate was awarded for the 23rd consecutive year . The updated Parks & Recreation Master Plan was approved by the Board of Park Commissioners at its January Board meeting. The Master Plan addresses the needs of a growing community with limited resources and includes a comprehensive inventory of Park District properties and amenities, as well as recommendations for improvements (based on a comparative analysis of recreational and leisure amenities available to Vernon Hills residents as compared with similar communities and to national standards). 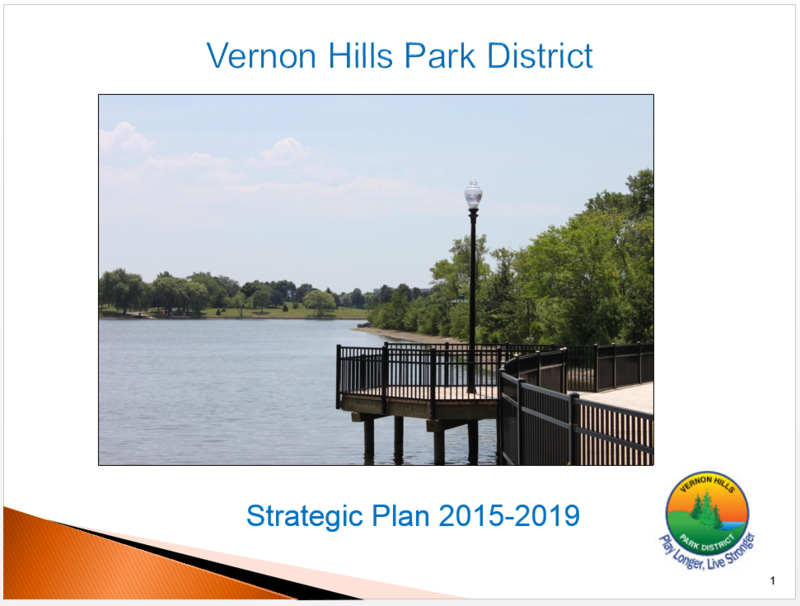 You may view a copy of the Vernon Hills Park District 2019-2023 Parks Master Plan on this website by clicking the link below. In addition, you may review a copy in person at the Sullivan Community Center. All Park District programs, operations, capital improvements, and maintenance expenses are funded through a combination of revenue sources including property taxes, user fees & charges, grants, and donations. A budget is developed on an annual basis by the Superintendent of Finance & HR and the Executive Director, with input from staff, and is approved by the Park Board each year at the May, Park Board Meeting. The annual budget provides the expected revenue and expenses by program and service that the agency anticipates spending within its fiscal year, which runs from June 1 through May 31. In accordance with Illinois State Law, the budget is made conveniently available for inspection 30 days prior to the May Board meeting at the District’s administrative office at the Sullivan Community Center at 635 N. Aspen Drive. A budget hearing is held in early May to provide an opportunity for public comment prior to the Board voting on the passage of the budget. Notice of this public hearing is published in a local newspaper no less than 7 days before the hearing. As required by Illinois Park District law, each year an independent agency is hired to audit the Park District’s financial statements and operating funds. The audit is a comprehensive financial analysis of the Park District’s operations and procedures when it comes to handling public finances. The Vernon Hills Park District has received the Certificate of Achievement for Excellence in Financial Reporting from the Government Finance Officers Association. This national award has been received for over 20 years. The Prevailing Wage Act requires contractors and subcontractors to pay laborers, workers and mechanics employed on public works construction projects no less than the general prevailing rate of wages (consisting of hourly cash wages plus fringe benefits) for work of a similar character in the county where the work is performed.